The Calico Oranda features a festive, confetti-like blend of reds, oranges, white, and black. 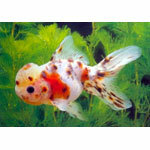 This coloration gives the Calico Oranda wonderful character and adds instant visual interest. The Calico Oranda closely resembles Veil Tail goldfish varieties in the shape and length of the tail, and is one of many varieties of what is collectively known as ornamental or fancy goldfish; Carassius auratus auratus. 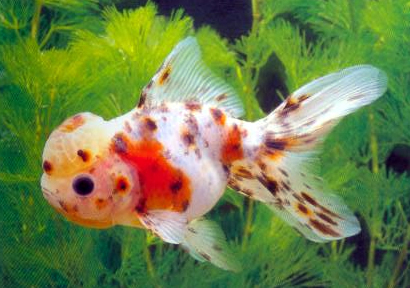 The Calico Oranda is an omnivorous species and can eat foods that contain both plant and meat ingredients. They will eat both dried and live food but recommend keeping their meaty intake to a minimal. 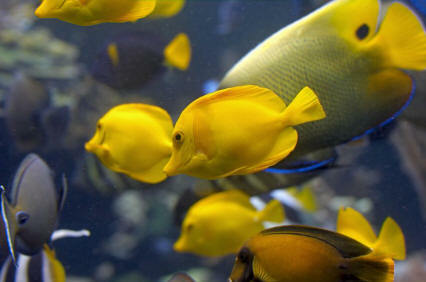 A flake or pellet food formulated for the goldfish with provide the proper nutrients for vibrant color and health. Calico Oranda Goldfish are unique in appearance and have beautiful multicolored scales. 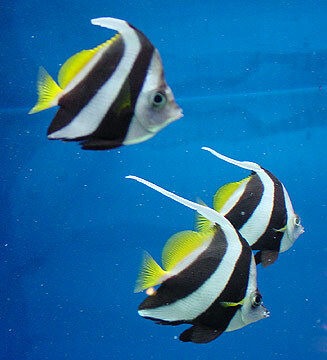 These fish have become quite popular, due to their docile natures and lovely though interesting physical qualities. Goldfish can be long-lived in captivity, with 10 to 25 years not uncommon; there is one report of a fish living to the age of 43.